Elliott and Pitterson to Clash in Jamaican Blitz Final! Pitterson and Elliott to Clash in Jamaican Blitz Final! Bert Scott, "Elliott to Challenge Pitterson for 2002 National Blitz Championship," Jamaican Ambassadors Academy, September 2002. FIDE Master Warren Elliott defeated Jamaica champion NM Shane Matthews 12-10 in the National Blitz Championship Candidates Final on Sunday. The match was close throughout and keenly contested. After the first 12 games, the score was tied 6-6. To break the impasse, a player had to win 2 games straight. Elliott and Matthews traded wins for the next 8 games until Elliott persevered and won games 21 and 22 thus winning the long grueling Candidates Final 12-10. 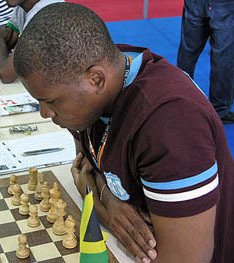 This was the longest Blitz match in Jamaica's chess history. FM Elliott will play defending champion NM Jomo Pitterson in the National Blitz Championship final on Sunday, September 22.